Members of this family are known commonly as Firefish , Scorpionfish, Rockfish, Stonefish, or Lionfish (amongst others). They belong to the order Scorpaeniformes, which includes 35 families, 300 genera, and more than 1,000 species. They are important both in the marine aquarium trade and as food (those of us fish-eaters living on the west coast are familiar with "Pacific Snapper" which is not a snapper at all-it's from the family Scorpaenidae). Fishes from the family Scorpaenidae are widely distributed throughout the oceans of the world (temperate and tropical), but the so-called lionfishes which are of the most interest to the marine hobbyist are indigenous to the tropical Indo-Pacific (although they have now established themselves along the eastern seaboard of the United States). The species most often seen in the home aquarium are from the subfamily Pteroinae and the genera Brachypterois, Pterois and Dendrochirus. Of these three genera, the genus Pterois are the true lionfishes while the species in the other genera are generally referred to in the hobby as the dwarf lionfishes. Specimens from the genus Brachypterois are rarely seen in the hobby. All species of the subfamily Pteroinae are hearty, dramatic-looking and very capable of causing the lackadaisical aquarist a whole world of hurt through their powerful sting. Nonetheless, the potential of being stung is far outweighed in most hobbyists' minds by the positive attributes of the extraordinary lionfish. The lionfishes from the genus Pterois get their name from the Greek word "pteron" which translates to "wing." Indeed, a large Pterois in open water-pectoral fins outstretched-is very much like a winged creature. Add to this display the rearing dorsal fin, and you can clearly see why this fish with a mane is commonly called a lionfish. The most recognizable species in the industry is the Red Lionfish (P. volitans). This impressive fish (not to be confused with P. lunulata or the Luna Lion, which is often sold as a red volitans) has earned its way onto the stamps of at least eight countries and into thousands of marine aquaria. Growing up to a foot and a half in length, these are very impressive animals. The Red Lionfish, it should be noted, is not always red, and as such, members of the same species should not be confused based on dramatic color differences alone. Red Lionfish living in estuaries can be almost entirely black while those that inhabit outer reefs down to 55 meters may be much brighter in color. Generally nocturnal, the Red Lionfish in the wild spends its days upside down in a cave or head down in a rock crevice. When hunting, it uses its large pectoral fins to corral its prey (small fish and invertebrates such as shrimp and crabs) before stinging and consuming it. In captivity, the Red Lionfish is, in many ways, an aquarist's dream. Provided with the right captive habitat and diet, this fish will be long-lived and the center of attention for anyone viewing your aquarium. The other two genera of lionfish are generally thought of as the dwarf lionfish. They seldom exceed six inches in length. As already mentioned, specimens from the genus Brachypterois are rarely seen in the hobby, but dwarf lionfish from the genus Dendrochirus are quite common. In many ways, dwarf lionfish possess all the appeal of their larger kin, just in a smaller size. Although the dwarfs tend to be somewhat more sedentary and stick closer to the bottom of the tank, they can be kept in tanks half the size of those required for a Red Lionfish. Of the dwarfs one might consider, the Zebra Turkeyfish (Dendrochirus zebra) is always a favorite and relatively common. Many hobbyists swear that the less common Fuzzy Dwarf (Dendrochirus brachypterus) is the most "personable" of all lionfish. Despite their differences in size, the true lionfish and the dwarf lionfish have similar captive habitat requirements (except, of course, for minimum tank size). Lionfish have a reputation as being remarkably hearty fish (second only to damsels some say), and while this is true, some care should be taken to provide lionfish with an environment that meets their species-specific needs. Because lionfish are nocturnal, they will not appreciate tanks that are brightly lit with metal halides unless there are places in the tank that remain heavily shaded. From the lionfish's perspective, even a relatively dark refuge in a tank illuminated by metal halides is inferior to a tank lit by low illumination fluorescents. More than one captive lionfish has been permanently damaged by being blinded by lights that are too bright. Lionfish are not known to be particularly territorial and will share their cave or another place of refuge with members of their own species or other lionfish species. Having said this, keep in mind that recommended stocking densities for true lionfish are about 40 gallons per lionfish (and about half that for the dwarfs). In terms of water chemistry, while lionfish will appreciate stability in the system, they are remarkably resilient and can survive dismal water conditions (although this obviously should not be the goal). Lionfish do make a mess, and as a result, excellent mechanical/biological filtration and protein skimming are essential. Without appropriate filtration, a dive in alkaline reserve is likely to be accompanied by plunging pH necessitating a massive emergency water change. All this, of course, can be avoided by appropriate filtration, excellent protein skimming, and regular water changes. Everyone knows when you go to the zoo not to feed the lions. If everyone kept the same in mind with their lionfish, far fewer would die in captivity each year. The reason you don't feed the lions at the zoo is that they are already being fed a healthy, appropriate diet by their keepers, and while there are those who may love to show off their lionfish snacking on live goldfish, this is really not in the best interest of the animal. It is true that some lionfish will not readily accept a captive diet (in which case it may be necessary to offer the specimen a live shrimp, small fish or crab at first), but the goal should always be to try to get the fish eating a captive diet. One technique that works well is the feed your new lionfish live feeder shrimp mixed with frozen mysis shrimp. Over time (days to weeks depending on the individual fish), increase the frozen mysis shrimp and decrease the live feeder shrimp until you have cut out the live food entirely. 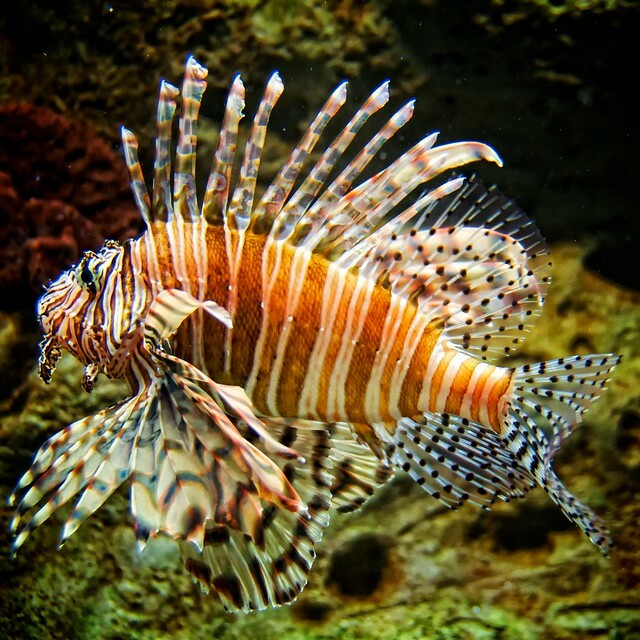 Eventually, lionfish should accept a captive diet including fresh or frozen foods such as krill, shrimp, silversides, and various prepared foods. Once the lionfish is settled in, offer food on a feeding stick, but don't force the issue. Feeding one to three times a week should be sufficient. Keep in mind that lionfish will eat smaller fishes, ornamental shrimps and crabs in your system, and remember that their mouths can open to leviathan proportions. It is not uncommon to see some fin rot due to handling during the shipping process, and this is easily taken care of with furan compounds. Copper treatments are highly effective with lionfish suffering from protozoal infections like Cryptocaryon. "Coughing" or "shaking" disease is something you will experience with lionfish, but it's actually not a disease at all. This is a common behavior and aids in the shedding of skin (necessary to purge algae and sessile invertebrates that have attached themselves to the fish). In short, it is a perfectly normal part of life for many of these fishes. At the beginning of the article, it was cautioned that lionfishes are capable of a powerful sting. This is true and something of which any aquarist should be aware before purchasing one. Lionfish are not poisonous, as if often stated-remember, many species in the family Scorpaenidae are important food sources. Instead, they are venomous meaning that they deliver their venom or toxin through injection (not ingestion). Lionfish have venom sacs connected to their spines, and while there have been reports of some individuals aggressively "charging" the hobbyist's hand when in the tank, most stings are the result of careless contact while cleaning the tank or handling the fish. If you are stung (either by an alive or dead specimen), it will most likely be painful and, although rarely fatal, it is possible to have a very severe reaction necessitating the attention of a physician. In most cases, however, expect a reaction like a bee sting. If you experience more serious signs and symptoms including, but not limited to, shortness of breath, nausea, and fever seek medical attention immediately. In conclusion, while there is some risk in choosing to keep lionfish from the family Scorpaenidae, most hobbyists agree that the good far outweighs the bad. These incredible "winged fish" are almost inconceivable in their delicate beauty. The fact that a fish so exotic-looking and interesting is also relatively easy to acquire, hearty and long-lived is the proverbial icing on the cake. Blue Zoo Aquatics was formed in 2001 as a custom aquarium design, manufacture, installation, and maintenance company which provided its services in and around Los Angeles, California. The company founders and key personnel had either a background in marine biology or had spent their entire career in the saltwater aquarium industry.